This chapter presents the basic concepts that apply to working with all think-cell elements. In the following, we will refer to the ribbon group by the term think-cell toolbar. Using the think-cell toolbar you can call most of think-cell’s functions. Note: We will also uniformly use the term Elements button to refer to the button Elements in PowerPoint, and the button Charts in Excel. 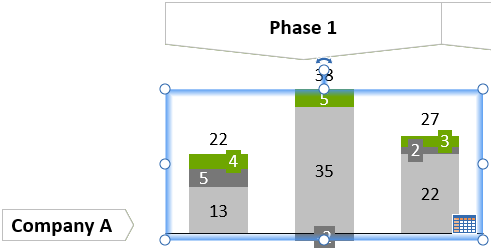 After clicking on the Elements button, the symbols in the first two rows represent building blocks for process flows (see Process flow), several helpful drawing objects (see Presentation tools) and agenda slides (see Agenda), while the other rows represent chart types (see Introduction to charting). Furthermore there are universal connectors to connect the elements (see Universal connectors for more information). And finally More offers additional valuable tools (see Presentation tools) to facilitate your daily work with PowerPoint. Inserting an element into your presentation is very similar to inserting a PowerPoint shape. To create a new element on a slide, go to the think-cell toolbar and click the Elements button. Then, select the required element. You may notice small arrow markers around some of the elements. Moving the mouse over these markers lets you select rotated and flipped versions of these elements. Press the Esc key to cancel the insert operation. Re-click the Elements button to select a different element. Click the left mouse button once to place the element with the default width and height. Hold down the left mouse button and drag the mouse to create a custom-sized element. Some elements have a fixed width for insertion; in this case, you can only alter the height. You can always change the size of the element later. When you are inserting or resizing an element, you will notice that it snaps to certain locations. With snapping, objects can be quickly and easily aligned. The highlighting of a border of some other object on the slide indicates that the element you are moving is currently aligned with that object. When resized, some elements snap to an automatically determined and predefined preferred size. 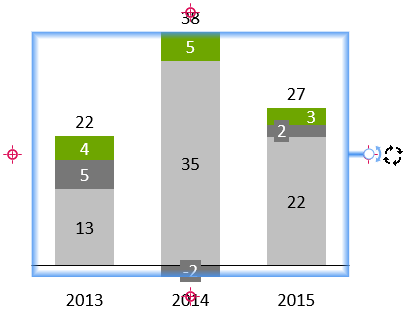 In the case of a column chart, for example, its preferred width depends on the number of columns. If you have manually changed the size of an element, you can easily change it back to the default width. It will snap when you come close enough to the default while adjusting the width with the mouse. As in PowerPoint, you can hold down the Alt key to move the mouse freely without snapping. 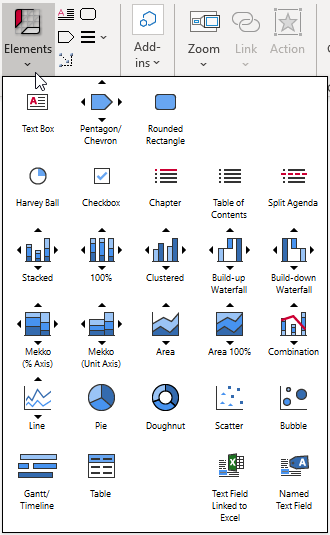 In the Elements menu, the small arrow markers around the pentagon/chevron and the stacked, clustered, 100%, line, area, waterfall and Mekko chart symbols let you insert flipped (and – if applicable – rotated) versions of these elements. Most elements can also be rotated after insertion using a rotation handle. Simply select the element and drag the rotation handle to the desired position: Click with the left mouse button on the rotation handle and, while holding the button down, drag the handle to one of the four possible red-highlighted positions and release the button. When an element is selected, resize handles are shown at the corners and in the center of the boundary lines. To resize an element, drag one of these handles. You can also set two or more elements to the same width or height. This also works if you include PowerPoint shapes in your selection. 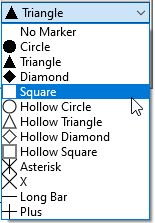 First, select all objects that you want to set to the same width or height (see Multi-selection). Then, choose Same Height or Same Width from the context menu of an element included in the selection. All objects will be resized to the same height or width, respectively. The height or width of all elements is set to the largest height or width among the individual elements. think-cell’s elements often contain individually selectable parts that we call features. For example, a chart element consists of the segments corresponding to the values in the datasheet and may also contain labels, axes, difference arrows, connectors and so forth. You can distinguish a feature by the orange frame that appears when the mouse pointer is over it. When you click it, the frame turns blue to mark it as the currently selected feature. Additionally a floating toolbar might appear. It contains a set of property controls you can use to give the feature a different look. It is a good idea to explore a newly-inserted element to get an overview of the features it is made of and their properties. When you right-click on a feature, its context menu appears. You use it to add additional features to the element or remove those currently visible. Buttons whose functions are unavailable for the current selection are greyed out. The context menu of the entire element is invoked by right-clicking the background of the element. Features always belong to their respective elements and can themselves have further features. As an example, the vertical axis of a line chart is a feature of the chart itself, while the tick marks along the axis are features of the axis. Consequently you use the chart’s context menu to switch on or off the vertical axis and the axis’ context menu to toggle whether tick marks are shown. Left-click the feature to select it and press the Delete or ← key on your keyboard. Right-click the feature to open the think-cell context menu. Click the Delete button to remove the feature from the element. Open the think-cell context menu that you used to add the feature. Click the same button again to remove it. 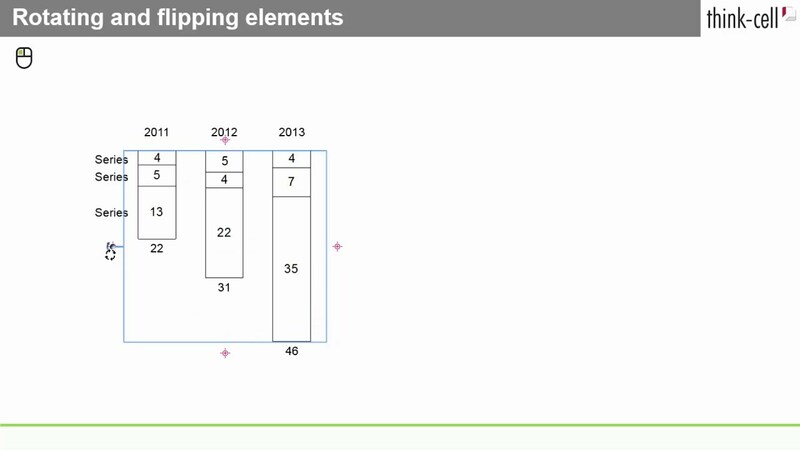 Note: You cannot remove data segments from a chart element in this way. All data segments shown are controlled by the internal datasheet. If you delete a cell from the internal datasheet, the corresponding data segment is removed from the chart element. Note: Buttons which toggle the presence of a feature, e.g. if series labels are shown in a chart or not, change their state accordingly. For example, after you have chosen Add Series Label to add series labels to a chart element, the button changes to Remove Series Label. In the following, generally only the state of the button for adding the feature is shown. Detailed information on all the available features is provided in the following chapters accompanying the respective elements they apply to. You can quickly select a range of features that belong together – this is called logical multi-selection. It works the same way as with files in Microsoft Windows Explorer: Select the first feature in the desired range with a single left mouse button click, then hold down Shift and click the last feature in the range. When you move the mouse while holding down Shift, the range of features that is going to be selected is highlighted in orange. To add single features to the selection, or to remove single features from the selection, hold down Ctrl while clicking. Again, this is the same way multi-selecting files works in Microsoft Windows Explorer. Using the keyboard to select a complete range is also possible. Select a feature with a single left mouse button click and press Ctrl+A. All features that could have been included in a range together with the selected feature are selected as well. Logical multi-selection is particularly useful if you want to colorize an entire data series in a chart element, or if you want to change the formatting of a range of labels. You can even use multi-selection to paste text into multiple labels at once (see Pasting text into multiple labels). In many cases, you do not need the mouse to select other objects on a slide. Instead, you can hold down the Alt key and use the cursor arrow keys ← → ↑ ↓ to select another object. 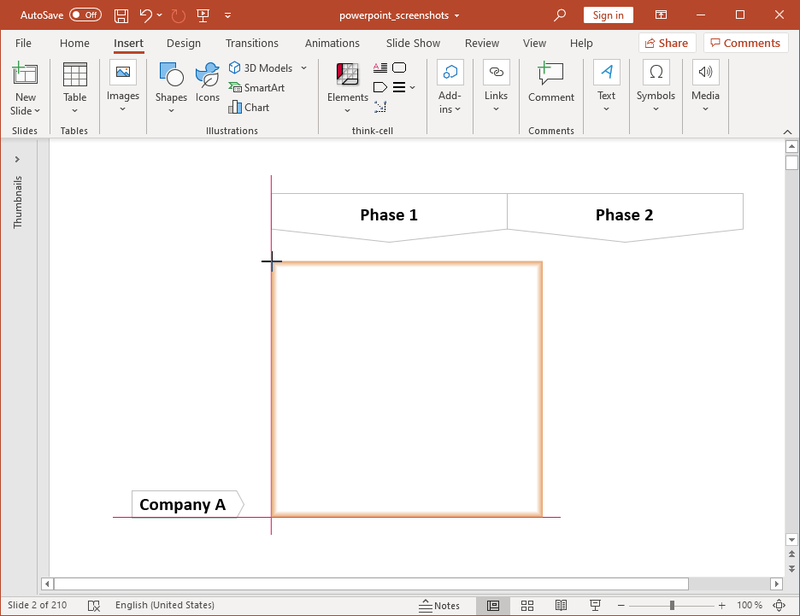 When a PowerPoint shape or think-cell element is selected, Alt with cursor keys selects the next shape that is found in the arrow’s direction. When an element’s feature is selected, Alt with cursor keys selects the next feature of the same kind in the element. However, you can only shift the focus to features of the same element. Use the mouse again to select a feature of another element. When editing a slide in a zoomed view (like 400%) it is often hard to move the slide around and locate the region that you want to work with next. With think-cell installed, you can use the middle mouse button to “pan” the slide: Just grab the slide with your mouse pointer by clicking the middle mouse button and move it where you need it. If your mouse has a wheel instead of a middle button, you can achieve the same effect by pressing down the wheel without turning it. 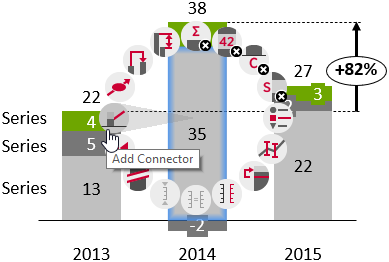 Note: You probably know that in PowerPoint you can zoom in and out using the mouse wheel with the Ctrl key held down. Together with the panning feature from think-cell, using zoomed views for slide design becomes easy and fast. When you select an element or feature by clicking on it a floating toolbar might appear. It contains property controls to change the look of the feature. Only the controls which are applicable to the selected feature are shown in the floating toolbar. In this chapter several general types of controls are described. Through the course of the following chapters, detailed information is provided for all property controls of the floating toolbar in the context of specific element and feature types. The color control applies to features that have a fill color and to lines in line charts. It does not apply to text, because the text color and the text background color are always set automatically. The list contains Like Excel Cell if you have enabled Use Excel Fill on Top in the color scheme control (see Color scheme). To reset the fill color of a segment you colored manually choose Like Excel Cell to use Excel’s cell formatting. 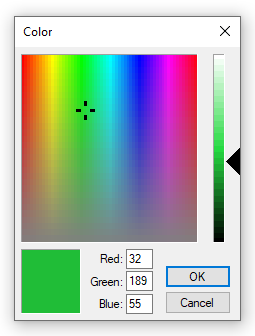 If you need other colors than offered by the color control, select the Custom option from the dropdown box. You will then be presented with a color picker where you can choose any color you like. Note: If you want to apply a color other than black or white, make sure that the slider for the brightness (on the very right of the dialog) is not set to minimum or maximum. When you move the slider up or down, you can watch how the color changes in the colored field on the bottom of the dialog. think-cell adds the most recently used custom colors to the color control for quick access. You will find a divider line in the list of most recently used colors: The colors above the divider are saved within the presentation, so you can rest assured that your colleagues have them available when editing the presentation. The colors below the divider are available on your computer only, because you were using them in a different presentation. Both sections can hold up to 8 colors. When you use a 9th custom color, the first one is removed from the list. You should use the color property when highlighting specific segments or one series in a chart. If you need to colorize an entire chart, use the color scheme property instead. The color scheme control applies consistent coloring to all segments of a chart, so the first series uses the first color in the color scheme, the second series the second color and so on. The coloring is automatically updated when a series is added or removed. See section Changing default colors and fonts for more information. 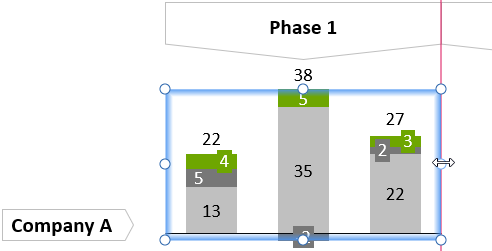 When you check Use Excel Fill on Top think-cell applies the color from Excel’s cell formatting to the chart in PowerPoint. This is particularly convenient if you want to control the chart colors through your Excel data source in the case of a linked chart. For instance the Conditional Formatting can help you to color positive values green and negative values red. If you have enabled Use Excel Fill on Top and the cell corresponding to a data segment does not have a fill color set as part of Excel’s cell formatting, then the appropriate color from the current color scheme is applied, i.e. the Excel fill color is applied on top of the color scheme. Note: Using Excel’s cell formatting to set a segment’s fill color does not work if you use conditional formatting rules in Excel and these rules contain functions or references to other cells. The segment sorting control applies a specific order to the segments in a chart. The default Segments in sheet order orders segments in the same order they appear in the datasheet. If you choose Segments in reverse sheet order the last series in the datasheet will be displayed at the top of the chart and the first series in the datasheet at the bottom of the chart. think-cell can also sort the segments in a category based on their value. Segments in descending order will sort all categories so that the largest segment in each category is on the baseline and sort the other segments in descending order, Segments in ascending order will display the segment with the smallest numerical value on the baseline. As a consequence of sorting, segments of the same data series, with the same color, will appear at different positions in different categories. The category sorting control applies a specific order to the categories in a chart. The default Categories in sheet order orders categories in the same order they appear in the datasheet. Categories in descending Y extent order will show the category with the greatest sum of values first and then sort in descending order. Categories in ascending Y extent order will show the category with the smallest sum of values first and then sort in ascending order. The chart type control switches to a different chart type for displaying the same data. 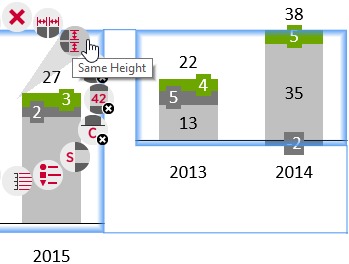 You can switch between the stacked, clustered, area and line chart. To switch to a 100% chart you would set the axis type to % (see Adjusting the value axis type). The line style control applies to the outlines of segments of column, bar and pie charts, basic elements, agenda chapters, lines in line charts, a chart’s baseline and to value lines (see Value line). You can also change a connector’s appearance using the line style control. In addition, the outline of the plot-area in all charts can be specified using the line style control. You can change the color of an outline with this control. It works for segments of column, bar and pie charts as well basic elements and agenda chapters. The line scheme control specifies the appearance of lines in line charts. The supported line schemes apply consistent line styles and coloring to all lines in the chart. You can also choose line schemes that highlight the data points along lines with markers. The marker shape control can be used to add or change markers for data points in line and scatter charts. Note that the marker scheme control should be used instead of marker shapes to add consistent markers to all the data points in a scatter chart. The marker scheme control applies consistent markers to data points in scatter charts. The markers are automatically updated when data points, groups and series are added or removed. The marker scheme control should be preferred over the marker shape control when adding consistent markers to an entire scatter chart. 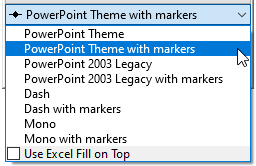 think-cell can use PowerPoint’s scheme colors for many elements and features (e.g. axes, text, arrows, etc.). 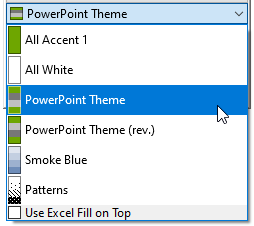 These colors as well as font definitions are always taken from the default colors and fonts of your presentation file. If the defaults are designed correctly, think-cell will follow seamlessly when you choose to switch the color scheme. In the ribbon, go to View. In the group Master Views, click on Slide Master. In the left pane showing the slide master and the different layouts with indentation, select the slide master. Please note that when opening the slide master view the layout type of the current slide is selected, so you need to scroll to the top and select the non-indented slide master instead. Adjust the fonts of the body text placeholder to match your corporate design. To adjust the default color settings, simply change your presentation’s color scheme by navigating to the color scheme settings and adjusting the colors to match your corporate design. In the ribbon, go to Design. In the group Themes, click on Colors. In the group Variants, click on the downward button in the bottom right. In general, it is advisable to store these defaults in a PowerPoint template file (*.potx) and to derive all new presentations from this template file. Please refer to the PowerPoint help for information on how to do this.